“The perspective that we cannot talk about China’s military or strategic goals and what we are doing to offset them because we will antagonize Beijing is exactly the wrong policy for the Navy and for our nation,” wrote Rep. Randy Forbes (R-Va.), chairman of the House Armed Services Seapower and Projection Forces Subcommittee for the Center for Strategic and International Studies (CSIS) Pacific Forum. Forbes piece comes a week after Chief of Naval Operations Adm. Jonathan Greenert told students and academics at the Naval War College in Newport, R.I. that open conversation on how to counter People’s Liberation Army‘s (PLA) military capabilities could antagonize China . “If you talk about it openly, you cross the line and unnecessarily antagonize,” Greenert said on June 17 in response to a question at the Current Strategy Forum 2014. 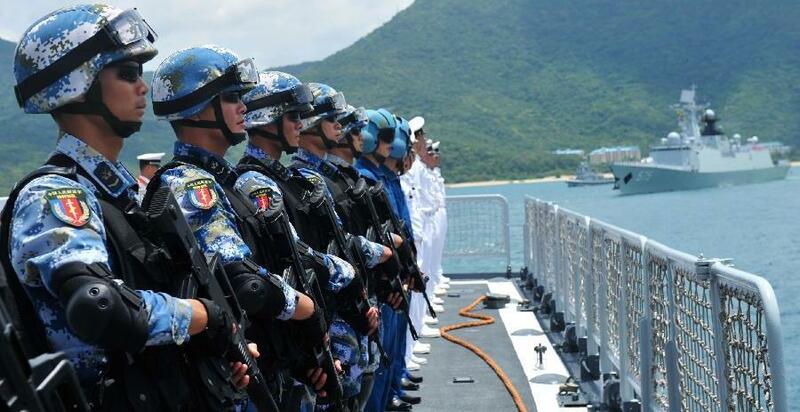 The Pentagon has sought increasing military-to-military cooperation with the People’s Liberation Army as the Chinese have expanded their regional influence and declared their aspirations for a larger role in world affairs, particularly on the seas. For example, China has sent four ships to the Rim of the Pacific Exercise 2014 (RIMPAC) — starting today — for the first time and will train with the U.S. Navy in naval tasks from humanitarian aid and disaster relief (HADR) and naval gunnery. The Office of Secretary of Defense (OSD) is quick to praise Chinese participation in RIMPAC and been careful not to single out China as a military competitor in public. Discussions of countering the growing military capability of the PLA does happen, but behind closed doors. “In a classified nature we look at all of this. There are groups up [Naval War College] that talk about it all the time,” Greenert said. When public assessments from military representatives do come out, they’re quickly walked back. Earlier this year, Pentagon spokesman Rear Adm. John Kirby downplayed comments from a U.S. Pacific Fleet intelligence officer that surmised that China expanded training to include scenarios for an invasion of the Japanese controlled Senkaku Islands. “It’s for China to speak to China’s intentions and motivations and their relations with their neighbors,” Kirby told reporters in February. However, Forbes argues that the Pentagon’s public lack of specificity of the threats they face — particularly China — make it difficult for Congress and the public to understand the military’s needs. “Our military’s capabilities for anti-surface and anti-air warfare, counter-mine operations, missile defense, long-range strike, and base resiliency are increasingly discussed in public briefings and strategy documents,” wrote Forbes. For its part, the Pentagon presents a generic narrative to the Hill and the public on its need for a future “all domain access” capability that doesn’t single out a specific country and leaves it to think tanks and strategy forums outside of the Pentagon to discuss Chinese military capability, Forbes argues. That lack of the why could hurt the Pentagon in Congress as it argues for funds, Forbes argues. “If the Pentagon aims to justify its budget to Congress as a whole and avoid further rounds of sequestration cuts, for instance, it will need to move beyond discussing missions and programs to identify the actual risks associated with failing to counter China’s emerging military capabilities,” he wrote. Forbes concluded that if China was going to enter in the realm as an international leader, its leadership should learn to develop a thicker skin when it came to criticism. “If China is indeed ascending to the position of a great power — which I believe they are — they too need to be able to listen to criticism and assess their actions without simply resorting to retaliation,” wrote Forbes.